Hey there, I inherited this problem when I bought the car, I know its not major, but It really annoys me everytime I step into the car. It appears that a good chunk of the vinyl on the base of the drivers seat has been ripped off. I have no clue how this happened, it came with the car. Anyone have tips of fixing this? I already one of those cheapo vinyl/leather fix kit...worst $6 ive ever spent. Could I go to some vinyl shop and order a square foot of thick vinyl of the color, or closest to it. Last edited by /Aerostar\; 04-28-04 at 04:32 PM. You already used a vinyl repair kit and it still looks like that? I don't think that's vinyl. If that happened my my car I'd just find the closest paint match and dab it on. It's not like you'll notice it after that's done. That is funny! I had to laugh. Hey guys I have the same problem too, never seem to bug me but now that the subject comes up, I ll try to fix it. I would probably clean it real good and spray it with vinyl paint. 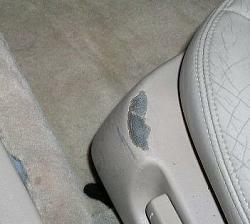 All you have to do is find an auto detail supplier and ask for interior match paint. a couple coats will seal off the ridges in the paint from the inconsistencies. My best buddy works as a master detailer. this will work. carbrite sells carpet paint, upolstry paint, etc... they have a paint for everything and they even have the correct color. PS this is a thread about Automotive Care & Detailing so guess where it is going? Quick Reply: Any advice on fixing this?